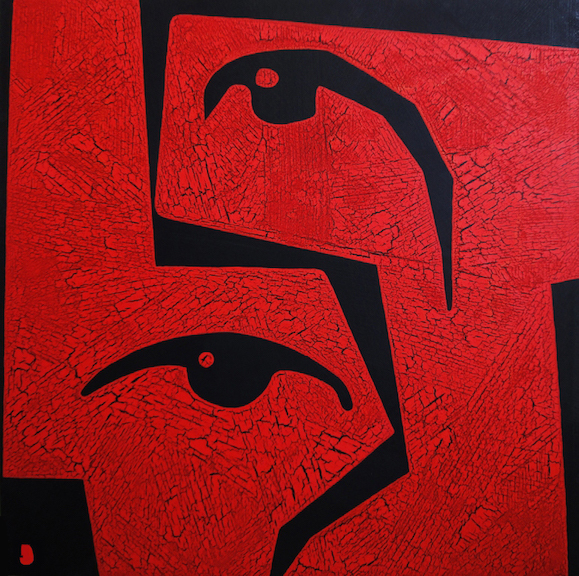 Sothea’s second series of paintings, “Look at Me”, demonstrates his personal progress and the development of his skills as a young artist. As Sothea realized that faces were missing in his previous paintings of bodies, he explores several styles and forms through the depiction of a single theme: the eyes. The variation in forms, from almost photographic realism to humorous Khmer calligraphy, allows him to hone his skills across styles of painting. In this series, Sothea also begins to develop his own trademark in his emerging work, through a nuanced use of cracks, trickles, and cracked drips of paint.